2Sisters Trading Post has prepared a great collection of plates for auction that is taking bids until November 14th, 2016. Over 60 lots are up and they are all opening for $1 and selling to the highest bidder. 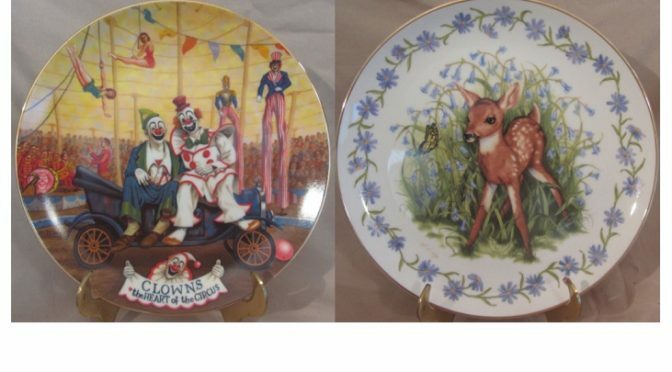 This is a large collection of collectors plates from the 1970’s, 80’s & 90’s. These plates are in excellent to mint condition, if any imperfections were noticed it has been noted in the description. Many are in the original boxes and most with paperwork and/or Certificate of Authenticity. The collection includes porcelain, pewter, copper, pewter and stained glass, and 3D plates. Bradford Exchange, Royal Cornwall, Ltd., & Edwin M. Knowles Co. are just some of the names found in this great collection. Highlights include a 1980 “Louise et Louisette, Spring” at Lot 6as. This is a 7 ½’ plate by Limoges. It is the first issue in a Bother’s Day Series by artist Josette Gravion. This porcelain plate series was limited to 12,500 and this is plate 1350 of the edition. It is in mint condition with paperwork. The images are posted in the online catalog. Lot 33as is a plate from 1979 of Antony and Cleopatra. As described by the auctioneer “10 1/4″ plate, dated 1979 ‘Antony and Cleopatra’ sculpted by Carl Romanelli and hand crafted in solid Incolay stone. This plate is the first issue in the Great Romances of History Collection and is No 10976. Comes in the original box and has paperwork with COA. ‘ There is a large selection of photos for full inspection of this highly collectible plate. Near the end of the catalog is another highlight from 1978 called “The Cobbler”. This beautiful plate is 8 ½ inches and is the second in the Rockwell heritage collection. It is endorsed and certified as a genuine “True Rockwell Classic”. The plate number is 8 171P and was made available by the Edwin M Knowles Company. This plate is not in the original box, however, is ready for display in the home collection. 2Sisters Trading Post run regular auctions highlighting collectibles for the home and family. Pricies are well below market value, and bidding is simple and easy through iCollector.com. This auction closes for bidding on Monday November 14th, 2016 at 6PM Central Time. They also have a great bid extenstion feature available for last moment bidders. If a piece takes a bid without 5 minutes of closing, that pice is extended or an additional 4 minutes to allow other bidders to get back in the action. All bidders should be on the website near closing time or check their email for out bid notifications.